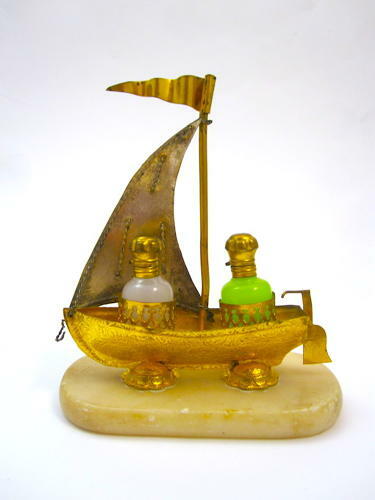 Antique Palais Royal 'Boat' Perfume Set Comprising of Dore Bronze Sailing Boat and 2 Original Opaline Glass Perfume Bottles. The Boat is Fine Detailed including Sail, Flag and Rudder. Each Opaline Glass Perfume Bottle has a Finely Chiselled Dore Bronze Stopper.